otakubishounen | A shinobi from the Hidden Leaf. A Pirate. A licensed Hunter. A State Alchemist. And a shinigami. Cosplay Mania announced their special guests for the upcoming Cosplay Mania 2018 which will be held on September 29-30 at SMX Convention Center, Mall of Asia, Philippines. Japanese stage actors Hiroki Ino and Kousuke Asuma, both known for their roles in Haikyuu!! stage play adaptation as Sugawara Koshi and Oikawa Tooru respectively, will be part of Cosplay Mania’s 10th anniversary celebration. This convention is one of the biggest in the country, with international cosplayers and J-music stars expected to make an appearance. Earlier this year, Cosplay Mania already revealed some of the other guest cosplayers which include Emperor Cosplay and Astarohime from Russia, Ola Aphrodite from Indonesia, and Hakken from Malaysia. Tickets and other details have yet to be announced. Check their official social media accounts and event page for more details and announcements. Posted in News and tagged cosplay, cosplay event, cosplay mania, cosplay mania 2018, cosplay mania 2018 philippines, event, Haikyuu! !, hiroki ino, kousuke asuma, Philippines, stage actors. Bookmark the permalink. What would you do if someone offered you a suspicious-looking drug and claimed that it would change your appearance to that of a 17-year old teenager? Furthermore, you would be part of an experiment in which you would have to return to high school for one year. Would you take the risk? That is the plot of ReLife. ReLife is a Japanese webtoon series created by Yayoiso in 2013 which ended with 222 chapters and published by NHN Japan on Comico. A 13-episode anime adaptation was released in 2016 with four additional OVA episodes. Back then, I was interested to watch this anime but due to hectic school schedule, I had to delay it until I eventually forgot about it. It was only last week when I suddenly remembered to watch ReLife because I was planning to bingewatch anime. As expected, NEETS are ostracized by the society, and these people are actually chosen as the subjects of the ReLife experiment to give them another chance in life. After the one-year contract, if it is successful, then the company will even provide the subject a list of jobs that he/she can apply for. However, there is a bigger reason and background story as to why these people actually ended up as NEETs. The lesson? Never assume and criticize someone’s situation without knowing the real story behind everything. ReLife teaches us life lessons and values that we sometimes overlook, ignore, or take for granted. It sure hits you right in the feels. This story is all about growing up, facing the harsh reality of life and society, and overcoming all these problems. It’s about friendship and love, school and work. It will make you realize once again how important time is. You can never go back to the past; you can only look back and learn from your mistakes. But the wonderful memories you have created with your loved ones can never be erased. I will not divulge or spoil anything else, because I want you to savor every dialogue, scene, and chapter of the story. Just expect to laugh really hard and cry hard as well. I actually had a difficult time trying to stifle my tears. This is definitely a must-read webtoon. I have watched a lot of anime and read numerous webtoons so I think the art style is not that much special or different compared to others. Still, one of the reasons why I love reading webtoons is because all the chapters are colored compared to the traditional black and white manga. It’s a masterpiece. It might actually appear pretty simple to some (and I’m sure this kind of plot, at least some parts of it, has already been tackled in other stories) but the impact of this series (at least to me) is heavy. I suggest that you read the webtoon because they deleted some parts in the anime and they also did some minor changes in the scenes. At first, you would find some of them annoying, but what’s good about this series is that almost all the major characters undergo a transformation in terms of their beliefs and personality. I also find them relatable, and it probably will be the same for everyone else because we have all been through high school. As an adult, perhaps we have also experienced the ups and downs of being unemployed or bullied in the workplace. Be it as the competitive Rena or the forever-in-the-test-loophole Arata, we have all been there, one way or another. JUST. READ. THIS. WEBTOON. NOW. Posted in Anime, webtoon and tagged anime, comico, Japanese webtoon, ReLife, ReLife review, review, webtoon. Bookmark the permalink. Wow. I can’t believe it’s been two years since I last updated this blog. Honestly, I thought of giving this up since I really didn’t have any free time especially these past few months. I was too stressed to even update this, and I was too busy to actually watch anime and read manga because of my university life. But hey, it’s going to be my last year in school so I hope my schedule will not be as hectic as it used to be. After catching up to the latest chapter of BSD, I suddenly remembered that there’s this anime that I wanted to watch two years ago but then ended up in my TBW (To-be-watched) list. I loved it so much that I wanted to actually write a post about it here in my blog! My summer vacation is almost over so before my classes start, let me write a personal post about the shows that I have watched so far. I spent my two-month vacation watching anime rather than reading academic materials for my course. Yes, that’s right! Anyway, there were quite a few interesting anime series this spring and I listed some of them below! (Note: These are the only ones that I have watched so I can’t say that they are the best out of all the new shows released this season but these are pretty popular (and really good) so I suggest you give them a try! Boku No Hero Academia (My Hero Academia (僕のヒーローアカデミア) is a superhero-themed manga written by Kōhei Horikoshi. Its anime adaptation began in April this year and is expected to have a total of 13 episodes. As of this writing, there are already 10 episodes released so it’s almost finished. The story revolves around a “quirkless”-middle school student Izuku Midoriya who wants to be a superhero in a world where almost 80% of the population have quirks or superpowers. Despite the constant bullying from his classmates, esp. by his childhood friend Bakugou Katsuki, Midoriya continues to pursue his goal until he meets the number one superhero called All Might whom he also admires. Izuku eventually passes and enters the prestigious U.A High School, and from there, he gradually takes his first steps toward achieving his dreams of becoming a superhero. When I watched the first episode, I couldn’t help but somehow compare it to One Punch Man. But later on, I realized that it wasn’t the case. It’s true that both stories are about superheroes, but that’s just it. BnHA has its own distinct qualities that make it as one of the hottest anime series this season! I actually didn’t think that I would like it that much, but I guess I got really hooked on it that I even decided to read the manga to quickly get updated. Sad to say, I finished reading the current 94 chapters in just 2 days 😦 Now I’m just waiting for both the new episodes and chapters! Studio Bones should already prepare for a second season! 2. Koutetsujou no Kabaneri (Kabaneri of the Iron Fortress (甲鉄城のカバネリ) is produced by Wit Studio and is slated to have 12 episodes, with the first one airing in April. It is directed by Tetsurō Araki who also happened to be the director of Attack on Titan (anime) under the same animation studio. This probably explains why there are quite a few similarities with the two series. People who are infected with an unknown virus are turned into zombie-like humans called “kabane” which can only be killed if their hearts are pierced. To protect themselves, the citizens build stations where they can also get aboard some armored locomotives that allow them to be transported to other cities. Ikoma, the protagonist of the story, creates his own weapon that effectively defeats the monsters. However, he gets biten by one of the Kabane when his city gets invaded by hordes of zombie-like creatures. 3. Bungou Stray Dogs (Literary Stray Dogs 文豪ストレイドッグス) began its serialization in 2012 and is written and illustrated by Kafka Asagiri and Sango Harukawa, respectively. The anime adaptation is produced by Studio Bones and the first episode aired in April this year. It is slated to have 12 episodes and a second season is also expected to take place sometime in October. Right now, ten episodes have been broadcasted already so it’s about to end soon. The names of the characters in this series are all taken from and inspired by real-life literary writers. Each of them possesses supernatural powers (which can also be associated with the authors where they are named after). The story centers around Atsushi Nakajima who joins the Armed Detective Agency after getting kicked out of the orphanage where he had been staying. There, he teams up with the agents in fighting against the Port Mafia members who are after him because of his powers that he himself was not aware of. Mysteries are discovered and new characters get introduced almost every episode so the level of interest rises as well. The character designs are good, and the genre is also my cup of tea. And yes, Miyano Mamoru also voices one of the main characters Osamu Dazai whose quirky personality will surely capture everyone’s heart. This anime adaptation by Silver Link studio began in April, and the series is just three episodes away from its finale. Aside from its 12-episode anime, Silver Link also releases a set of special episodes simultaneously. There are currently 21 shorts released as of this moment. It’s called Tanaka-kun wa Kyou mo Kedaruge and each part runs for less than a minute. The anime stays true to its genre: slice of life mixed with comedy. Though some viewers may find it somewhat boring, for me, it’s actually quite relaxing. Perhaps it’s because I can relate to the character of Tanaka whose listlessness awakens my inner languidness LOL. The plot is very simple: Tanaka is listless. That’s just it. Somehow, he manages to be friends with the energetic and oh-so-reliable student named Ohta who seems like his knight in shining armor. It’s strangely comedic and more often than not, the scenes reflect the ordinary life of a student (or not). Sometimes, this anime will leave you questioning your own listlessness. But then again, no one can probably surpass Tanaka-kun in that area. And did I mention that I also read its manga? We’re all just like Tanaka. 5. Sakamoto Desu Ga? (Haven’t You Heard? I’m Sakamoto 坂本ですが？) Cool? Cooler? Coolest? Well that’s who Sakamoto is. This manga created by Nami Sano is adapted into a 13-episode anime by Studio Deen. The story is about a high school student named Sakamoto who is deemed as the “coolest” guy in their school. Girls instantly fall in love with him while boys envy him. His incomparable talents, wits, good looks and popularity make him the usual target of pranks and bullying from people who instantly see him as a rival or enemy. Well, Sakamoto is still fabulous. Ridiculously fabulous. I heard some good feedback from other viewers about them so I might give them a try soon! Posted in Anime and tagged 2016 anime, anime, attack on titan, Boku No Hero Academia, Bungou Stray Dogs, Joker Game, Kabaneri of the Iron Fortress, Kiznaiver, Koutetsujou no Kabaneri, Literary Stray Dogs, Miyano Mamoru, My Hero Academia, One Punch-Man, Sakamoto, Sakamoto desu ga, Sousei no Onmyouji, spring anime, Tanaka-kun is Always Listless, Tanaka-kun wa Itsumo Kedaruge. Bookmark the permalink. I first watched its 12-episode anime series and it was interesting enough for me to read the manga for a more in-depth understanding of the story. In the anime version, the production altered some parts of the story especially the last few episodes but at least the major parts were retained. The art and animation of the characters and the background were drawn incredibly. ERASED resembles Detective Conan since the plot revolves around finding the real culprit, and if you are a fan of time travel stories, then you must surely watch this one! I also do recommend reading the manga after (or before) watching the anime to give you a better understanding of the characters’ backgrounds as well as its ending. Boku Dake ga Inai Machi is definitely one of the best anime series this year and in fact, a live-action film was also released just last month featuring Tatsuya Fujiwara. Here’s the anime’s trailer to give you a taste of what ERASED is all about. Posted in Anime, Manga and tagged anime, Boku Dake Ga Inai Machi, ERASED, ERASED review, Kayo Hinazuki, manga, review, Satoru Fujinuma, The Town Where Only I am Missing. Bookmark the permalink. I just finished watching the 13-episode anime of Ajin and the first part of its trilogy film which just basically summarized the first half of the anime series. I read a lot of posts about the seemingly good story of Gamon Sakurai-san’s manga-turned-anime-and-movie. It piqued my interest but when I discovered that it was in 3D/CG format (as it was released under Polygon Picture) I had my doubts since I am not really a fan of CGs in anime and I’m one of those who prefers the traditional 2D style. Nevertheless, the plot of the story was good enough to keep me going past the first episode. In fact, it no longer became an issue to me as I glued my eyes on what is going on with the story. Now let’s take a look at its synopsis first. In all fairness to the producers of the anime and film, they did stick to the main story of the manga despite some slight changes with the little details. It has a mixture of action, horror, mystery and supernatural elements wonderfully blended together. (I also actually read the manga right after watching it and just to spoil you a bit, Kei has some comical moments/more so like facial expressions in the recent chapters which, I hope, will be shown in the next film or second season perhaps of the anime.) The action scenes really put me at the edge of my seat, and the experiments conducted on Kei made me cringe in horror. I was somehow looking forward to seeing more of Kei’s development as a fighter but I guess it will take a few more chapters for that. Sato-san is obviously the main antagonist in the story but somehow, even just for a bit, I feel like he had his reasons for being a sadistic player. It seems like the background story about him in the manga doesn’t fully explain why he turned out to be as bloodthirsty as he is right now. He is like the epitome of monstrosity, both literally and figuratively. Anyway, to wrap it up, I’ll give this manga/anime/film a 6.5 rating. ! (•̀ᴗ•́)و ̑̑ You should definitely try this one! Posted in Anime, Manga, Movie and tagged Ajin, Ajin: Demi-Human, Ajin: Demi-Human Review, anime, IBM, Kei Nagai, manga, movie, review. Bookmark the permalink. First of all, I would like to apologize for my long hiatus since I’ve been really busy with my university stuff T^T It is now my summer break so I can probably update this blog once in a while with some news and reviews about the series that I have watched recently. Thank you so much! Posted in Random and tagged personal. Bookmark the permalink. This year is notable for the numerous number of manga series which have been adapted into live-action films and TV dramas. For instance, Death Note is once again relived through a television drama series which premiered in July. It stars Masataka Kubota (Light Yagami) and Kento Yamazaki (L) as the main protagonists of the story. Hajime Isayama’s Shingeki no Kyojin (Attack on Titan) also got a two-part live-action film adaptation which features Haruma Miura as Eren Jaeger. The first part was released in Japan last month, while the second installment will be shown on September 19. And just recently, another series was green-lit for a live-action movie. Ayuko Hatta’s shojo manga Ōkami Shōjo to Kuro Ōji (Wolf Girl and Black Prince) is going to release its film adaptation in May next year. The cast includes Fumi Nikaidō (Erika Shinohara) and Kento Yamazaki (Kyōya Sata). The latter will also play the role of Kōsei Arima in another live-action film adaptation of Naoshi Arakawa’s Your Lie in April. The official website of Ōkami Shōjo to Kuro Ōji movie also uploaded a 13-second clip of the film which presents the cast and cites Ryūichi Hiroki as the director of the film. The filming will begin in December and will conclude in January next year. The manga, on the other hand, is still ongoing and is published by Shueisha on Bessatsu Margaret magazine. A 12-episode anime TV series was also aired in October last year until December. Posted in Movie and tagged Erika Shinohara, Fumi Nikaidō, Kento Yamazaki, Kyōya Sata, live-action film adaptation, live-action movie, Wolf Girl and Black Prince, Ōkami Shōjo to Kuro Ōji. Bookmark the permalink. 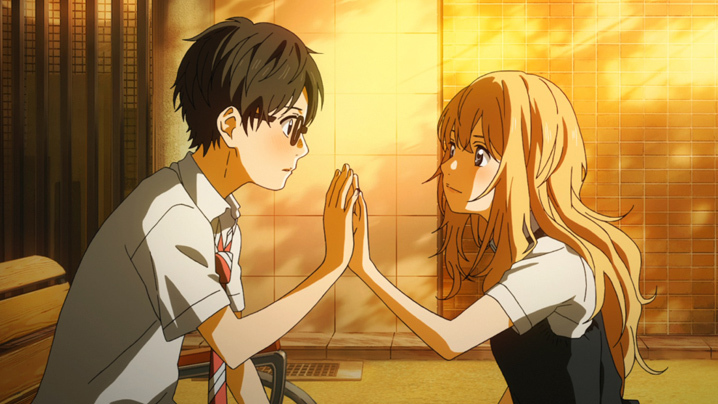 After the 22-episode anime TV series of Your Lie in April concluded in March this year, it was confirmed that a live-action film adaptation is also going to be created. Naoshi Arakawa’s manga will be turned into a movie which will star Kento Yamazaki and Suzu Hirose as Kōsei Arima and Kaori Miyazono, respectively. Joining them are E-girls’ Anna Ishii (Tsubaki Sawabe) and Taishi Nakagawa (Ryōta Watari). Yukari Tatsui is the scriptwriter while Takehiko Shinjō is directing the film which is slated to be screened in Japan in 2016. The manga was published by Kodansha on its Monthly Shōnen Magazine from April 2011 until February this year. Posted in Movie and tagged Anna Ishii, Kaori Miyazono, Kento Yamazaki, Kento Yamazaki to Star in "Your Lie in April" Live-Action Movie, Kōsei Arima, live-action film, live-action film adaptation, movie, Naoshi Arakawa, Ryōta Watari, Suzu Hirose, Taishi Nakagawa, Tsubaki Sawabe, Your Lie in April. Bookmark the permalink. The long wait is over! It has finally been confirmed that the second season of Haikyuu! !’s anime adaptation will air in October this year on MBS, Tokyo MX TV, CBC, BS11, and other TV channels. The 40th issue of Shueisha’s Weekly Shonen Jump magazine also teased the fans with the main visual including the characters in Haruichi Furudate’s manga series. It was also announced that Sumire Morohoshi will join the cast as Hitoka Yachi. The first season of Haikyuu!! premiered in April and concluded in September last year with a total of 25 episodes. The manga, on the other hand, which is published by Shueisha, is still ongoing. Posted in Anime and tagged anime, Haikyuu! !, Haikyuu!! anime, Haikyuu!! 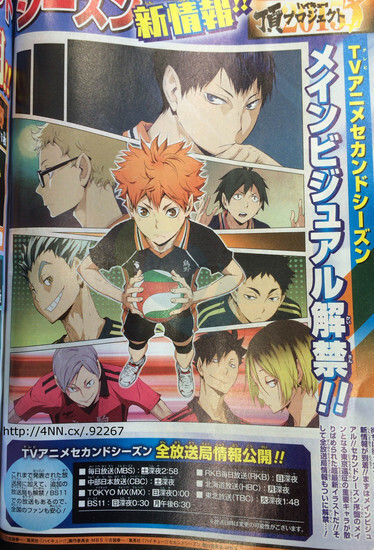 Anime Adaptation to Air Season 2 in October, Haikyuu!! second season, Haruichi Furudate, Shueisha, Sumire Morohoshi. Bookmark the permalink.